Swiftcover was formed in 2005 by a group of former Churchill Insurance executives and is an internet only based insurance company. 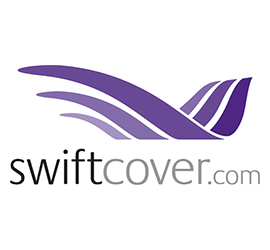 In 2007 Swiftcover was acquired by AXA and is now still a wholly owned subsidiary of AXA UK. Swiftcover offer customers the ability manage their policy (including changes to policies) online and any contact can be done via email. This also means you can print off your own insurance certificates when and if you need them. From 2009 through to 2011, Swiftcover used Iggy Pop to front their TV Adverts with the tagline “Get a Life!” which resulted in a ASA investigation due to Swiftcover not actually offering insurance to people in the entertainment industry. From 2011 they have moved their advertising in a new direction featuring a family of animated characters voiced by celebrities including Reece Shearsmith and Steve Pemberton, Chris Evans and Noddy Holder. Swiftcover concentrate on just comprehensive and third party fire and theft car insurance and do not offer the lowest level of third party insurance. They even reveal that 98.5% of new customers purchase comprehensive insurance showing what excellent value they believe their insurance prices to be. Should you be involved in an accident and your vehicle requires repairing, Swiftcover offer free collection and delivery in the event of a claim, and clean your car inside and out after it’s repaired. Theres also a five year guarantee for all repairs carried out at one of their approved repair centres. As expected, Swiftcover also offer a number of optional extras with their policies. Legal cover up to £100,000 is available in case you are in an accident that is not your fault but still incure costs due to being hit by an uninsured driver. Medical costs can also be recovered as well as compensation in the event that you are injured and unable to work. Swiftcover allow you to protect your no claims bonus if you have accumulated four years or more and this allows you to make either one claim in a year or two claims in three years and your no claims bonus will be affected. This only costs a minimal amount and is always worth considering with whichever insurance provider you choose.